Yesterday I said the radio preacher told us exactly who the False Prophet and the Anti-Christ are. I did not mean to imply he spoke any names for these two sinister individuals. A lot of ignorance exists so there are a lot of misunderstandings. Unfortunately many of the misunderstandings emanate from those who are alleged to be expert. Dogma exists across the entire gamut of higher education and its dogmatic offspring the students moving toward expertise. Crazy Karnaze, as self labeled, was my Engineering Physics professor. He told me once, “It is refreshing to have you in my class because you don’t merely take whatever I say at face value.” This is unfortunately a face value world where far too many don’t do enough independent thinking. Here for example, as many say: “The word rapture ain’t even in the Bible.” I would bet a million dollars that it is, if I had the money to back my bet.” It’s tempting to do it anyway, though it’s not strictly honest to do so, because it’s among the perfect sucker bets available upon the earth. A sucker bet for the uninitiated means you are betting on a fact your are certain is correct with someone who is ignorant of the fact, yet overconfident. For instance my dad told me at work one day a guy there bet another engineer, fifty dollars, that the change machine there would give him change for a twenty. A guy took the bet in front of several colleagues. The first guy said OK. He put the twenty in the change machine and received $ 5.00 in quarters. He, indeed, had change in his hand for the twenty. The other guy opened his wallet and produced the fifty. Better than the stock market. That is a sucker bet. The words “caught up” here are translated in the Latin Vulgate [by Jerome] as “rapiemur” or in English “rapture” coming from the Greek Word Harpozo [pronounced Harpodzo]. The word Rapture is assuredly there. The when: The Bride of Christ is how the church (all those who believe … John 5: 24) is referred to in scripture. Those who claim no rapture or post tribulation rapture praise the Lord for the new custom of handing your bride over to those who hate you so they get a chance to beat the crap out of her before the wedding day. Encouraging to be Harpozoed before the “Time of Jacob’s Trouble” as the tribulation is called. The tribulation is the Wrath of the Lamb (Jesus, the Lamb of God) a period of judgment on those who reject Jesus, some of whom believe and are saved, to include the Jews the remnant is preserved in the face of the entire world attempting to destroy them completely as Hitler, Hadrian, Nero, Epiphanies and the Long list back into antiquity. Cain had the knowledge of good and evil. He was told to overcome his sin. Free will for all the Calvinists. “Deny yourself” indicates an issue of the will of man. Free will aside from the will of God. Here we have more ignorance from the other end of the spectrum. The obedient ones [allegedly] walking on the eggshells of fear. They believe that the free gift given them by God can be unearned. God demands Holiness they say. The Bible does say that. My problem, personally, is not with the Bible’s statement here; rather their definition. They claim to be obedient and Jesus knowing better moving the law from stone tablets into the hearts of men, as prophesied in Jeremiah 31: 31-34. In Matthew 5: 29, Jesus said, “If you look at a woman lustfully you have already committed adultery with her in your heart.” He suggested remedies involving removing parts of their body and I notice few one eyed Christians to match all this yammering about obedience. “Very truly I tell you, whoever hears my word and believes him who sent me has eternal life and will not be judged but has crossed over from death to life. 25 Very truly I tell you, a time is coming and has now come when the dead will hear the voice of the Son of God and those who hear will live. 26 For as the Father has life in himself, so he has granted the Son also to have life in himself. 27 And he has given him authority to judge because he is the Son of Man. Those he describes as “those who have done what is good” are those who believe Jesus, deny themselves and surrender to him every day. Those who reject Jesus as the crucified and risen Son of God serve Satan. Those who serve Satan will be judged according to God’s wrath at the end of the age when all who ever lived, aside from the church (by then already resurrected, having received their reward) will be resurrected for the great white throne judgment in Revelation 20: 11-15. Church age believers and the tribulation saints have no part, as those being judged, in the white throne judgment as stated in Revelation 4-6. The False prophet? Over-complicated, in my opinion by the seminaried. In our day we are witnessing the consolidation of the worldwide religion under the leadership of Rome, incidentally the city on seven hills. Now in Revelation 13 we see the beast coming out of the sea. “Your merchants were the world’s important people. Look at the Statue of Liberty and you see seven spires on the crown. Illuminati symbols all over, the US, same as Europe. The spires on the Queen of Heaven statue given to us by France, are the seven oceans on which the woman sits. The EU Headquarters is a celebrated replica of the Tower of Babel. That great city, Babylon the Great, has its origin in the peoples of the Roman Empire and which rose to power over Europe, due to defeating the Axis (an iteration of Roman Empire) as the primary power from among the English speaking Allies, in the end is utterly destroyed as Babylon in history also. The Anti-Christ? In my books the math I searched out and present, reveals from Jesus’ words in Matthew 24 pointing to Daniel (abomination of desolation [IT standing in the Holy Place] and is confirmed by John in Revelation 11: 1 [Outer court given to the Gentiles]. On the Dome of the Rock the blasphemies predicted are stated in the tile mosaic. Anti-Christ! The Mahdi of Islam is the coming world leader called the anti-Christ and according to their eschatology Jesus (theirs) comes back to correct the Christians and Jews [pigs and dogs … infidels] to Islam. Their Jesus leads the armies at Armageddon to destroy Satan when he comes to earth. Anti-Christ. Bass Crack Ackwards. Important also to know those in Islam do not believe Jesus died and then rose from the dead. So what do we make of a Pope who is reported telling the world the God of Christianity (Son of God died and rose from the dead)and the God of Islam (Jesus never died but will come back to defeat the real Christ) are the one and the same. Clearly not. The False Prophet who deceives the world to believe a lie! A well known Messianic Jew (believes Jesus is the Messiah, crucified and risen) and church leader recently stated, he could not see how Jews would accept a Muslim as their messiah. The deceiving signs and wonders coupled with the powerful delusion sent by God on the inhabitants of the earth, who rejected Jesus, is how. Though as it is prophesied, there will be Tribulation Saints and the sealed remnant of the Jews who will preach the gospel. Chris Queen. 3/5/2019. Ask Jesus About Your Invitation To The Marriage Supper of the Lamb. Revelation 19: 9, 10; See also Revelation 21: 6, 7. Just ask him. He came for you. Keep Watch. Please hit the Follow Key above and to the right. Please leave your valued comments in the form below and more posts at the bottom of the form. You may access all the 200 plus posts by hitting “Blog” in the menu at the top of this page. 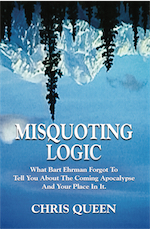 Please support my work by getting my books on Amazon, Misquoting Logic HERE or Misquoting Calculus HERE or through booklocker.com above, just Click the Misquoting Logic book cover image, above, or hit Free excerpts, there.